December 8th, 2018, San Bernardino, CA -Stars of HOPE®USA has attended San Bernardino’s Winter Wonderland Festival. Bringing hope to the community-at-large impacted by the senseless shooting on December 2nd, 2016. Honoring the lives taken and continue the healing of survivors and family members. Volunteers joined from the local Humane Society and accompanied by survivors and family members inspiring resiliency. Coming together to create art is a powerful way for people to build relationships and share stories and experiences in a safe environment. Participants began arriving before the official start time and the day was off to a healing start. Throughout the day children and adults painted beautiful messages of hope and healing for the victims of the Woosley Fires, Carr Fires, and Thousand Oaks where a tragic mass shooting had taken place on November 7th, 2018. Stars of HOPE is humbled to be returning to the Winter Wonderland community event each year by Cythina Alvarado-Crawford and host, City of San Bernardino. It is a day of music, games, and food with a toy drive and a visit from Mr. Claus. 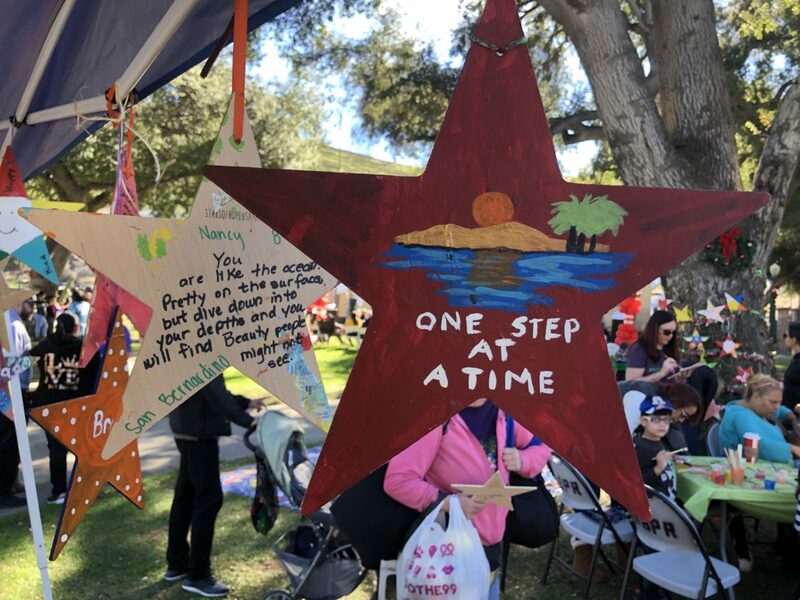 Stars of HOPE will continue to support the community of San Bernardino again next year with a goal of 1000 Stars of HOPE to continue the mission to create, empower, and heal. Do you know a community in need of HOPE?